French economist; leading member of the Physiocratic school and author of many economic treatises. Autograph Letter Signed, du Pont de Nemours, one full page, octavo, New York, December 24, 1800. In French, to Félix Faulcon, an old friend in Paris. 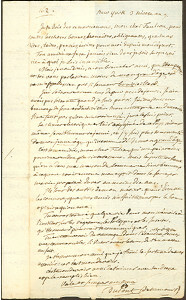 On the verso is a letter written by one of his daughters-in-law. you would talk less about my advancing years and would not so often refer to me as that nice old gentleman. I turned sixty-one only a few days ago. I was not even sixty when I left. I was always blessed with an energetic and active nature. It is a prerequisite of my type of business. Others may think of me as being old and tired. I am not. “This country’s dry climate and oxygenated air have even rejuvenated me to make me more interesting. But the well-placed trust that others have in my firm relies heavily on the fact that they believe me to be of clear mind and with a life expectancy of at least ten years. These are the tools of my trade. When God sees fit to bless me with them, let my friends not weaken the perception others have of them. Du Pont de Nemours, a man of lively intelligence and high ambition, was the protégé of Dr. Francois Quesnay, personal physician of Louis XV’s mistress, Madame de Pompadour, and leader of a faction known as the économists, a group of liberals at court dedicated to economic and agricultural reforms. Du Pont de Nemours wrote Physiocracy, which advocated low tariffs and free trade among nations. During the French Revolution, he and his son (the future founder of E.I Du Pont de Nemours and Company) physically defended Louis XVI and Marie Antoinette from a mob besieging the Tuileries Palace on August 10th, 1792. Condemned to the guillotine during the Reign of Terror, Du Pont was spared only because his execution was still pending when Robespierre fell on July 27th, 1794. 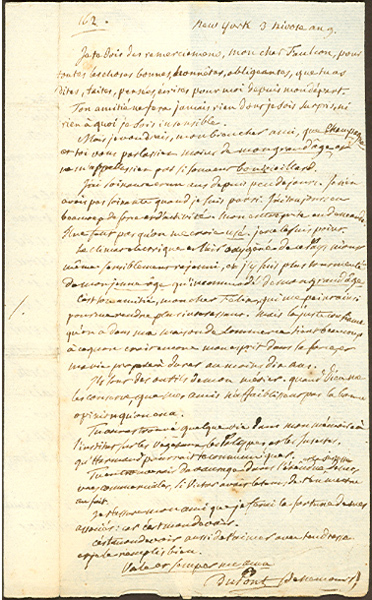 In 1799, after further horrors, he left France for the United States (at the age of 61, as he points out in this letter) with his entire family. Du Pont developed strong ties with industry and government, in particular with Thomas Jefferson. He is said to be the originator of an idea that eventually led to the Louisiana Purchase. His son, Eleuthère Irénée founded what would become one of the largest and most successful American corporations, E.I. du Pont de Nemours and Company.